SNOW AND ICE IN FLORIDA? YOU BET! Just head on to the Gaylord Palms Resort & Convention Center in the Kissimmee-St. Cloud area. 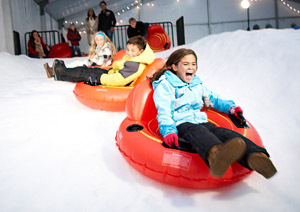 The 2.1-million-square-foot resort is celebrating its eighth annual Best of the Florida Christmas through Jan. 2, 2011, with several fun activities for the young and old alike, including ICE! and SNOW! exhibits. ICE! : Hand-carved from more than 2 million pounds of ice, you will walk through scenes of Clement Clarke Moore’s famous holiday poem “ ’Twas the night before Christmas.’ ” The average temperature inside the 16,500-square-foot attraction is 9 degrees. That’s Fahrenheit! After a stroll through the exhibit, you can take a slippery ride down on an ice slide. We suggest taking a jacket with you though oversized winter parkas are handed out before entering the exhibit. SNOW! 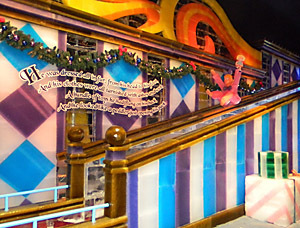 A NORTH POLE CARNIVAL: It’s a first for Gaylord! A 10,000-square-foot tent houses 40 tons of snow. Carnival games include Kiddie Snow Tube Run, Snowball Throw, Coke Bottle Toss, Flip a Penguin, Ring Around Frosty and Elf Bowl. Folks can make snowmen and snow sculptures, aim at a snowball target range and build igloos. 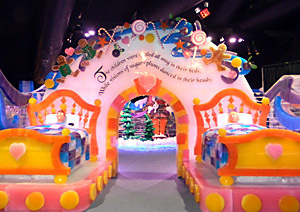 “A Visit to Santa Claus” is just a few steps away. For Gaylord’s The Best of Florida Christmas Celebration, the 4.5-acre indoor atrium has been decked up with lights, trees, poinsettias, wreaths, bows and garlands. And of course, Christmas carols and songs fill the hall. For reservations and more information, call (407) 586-2000.